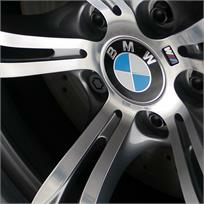 Return Your Damaged Alloys To A Stunning OEM Factory Finish. Exclusively offered as part of our Award Winning Detailing Services and using state of the art technology, we can completely refurbish damaged rims to their original factory finish. The tyres are inspected for wear prior to marking with a unique identification code. The tyre is then removed together with the valve and any balance weights. The wheel is placed in a pH neutral chemical solution for several hours to remove old paint to provide a perfect key for the subsequent paint and lacquer process. It is then thoroughly washed of all chemical deposits. The wheel is then low pressure bead blasted to completely smooth. The wheel passes through an oven to remove trapped air before moving into a spray booth to apply a powder coated primer. It then goes through a second oven to be baked (cured). A quality check is performed before proceeding to Stage Four. The wheel is pre-heated to optimum temperature before entering a sealed booth. The wheel is then professionally spray painted in the correct OEM colour. Highly Durable lacquer is applied to protect the wheel from salt, brake dust etc. Each wheel is carefully inspected to ensure OEM factory finish. A new rubber valve is fitted and the tyre carefully put back on. Each wheel is balanced, using stick-on weights to the inside of the wheel.